About: The Champion is a pub with background music. They offer a selection of ales, lagers and spirits as well as pub food. They can cater for private parties of up to 60 people and provide outside seating on the terrace. "Possibly the finest Samuel Smith pub in all of London"
Everyone likes to drink in an old pub now and then and they don’t come much better looking than The Champion. It’s all in the name. None of that, ‘I could have been somebody, I could’ve been a contender’ talk, this pub is a straight-up champion of tradition and it knows it. Located in the pub-heavy neighbourhood of Fitzrovia, an area of London where you’re likely to stumble on a pub on every other street, The Champion keeps the old boozer spirit alive. It is fancy only in its checkerboard-tiled floor, the ornate wood design and the dark sultriness of the interior. No cocktails, no craft beer; no gimmicks at all. As a Samuel Smith pub The Champion serves the usual mix of beers that come at an excellent price point. The Taddy is always a good bet but recently this writer has been enjoying the Wheat beer, finding its citrus notes that little bit more interesting than the rest of what’s on offer. The Champion is built around the bar in the middle. There is dark wood everywhere. Even the small table/booths by the windows are divided by extra wooden partitions as if when they were building they bought too much wood and just had to use it all up. It is dark thanks to the presence of all this wood, however, that means that the decorative stained glass windows are thrown centre stage whenever the sun shines through at the best angle. This site is worth a visit alone. But if you need others beside that, the glorious wood, the tiled floor and the general old-worldliness of the pub, then just think, you’ll be drinking in a pub called… The Champion. I have just viewed the pictures of the pub NOW and recall the times I frequented it way back in the 50s and 60s. Loved it then and it still looks great. Probably would not appeal to the Bohemians of that era, but, a bit of class never did any damage. Times change and so do pubs. Just down the road from the Duke of York as well is in its favour. Amazing interior!! If you ever want to show a visitor the delights of a beautiful traditional boozer then bring them here. The Champion is a Samuel Smith pub with so much character that it's probably Daniel Day Lewis' favourite pub! 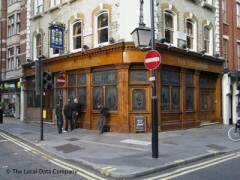 For a pleasant rest-bite in Fitzrovia, visit The Champion Pub on the corner of Wells St W.1. A Victoriana style pub serving excellent beverages at honest prices.Landlord Neil& staff Nick, Alice run a clean and pleasant pub. A lounge bar upstairs, beautiful stained glass windows, privicy booths. Stunning stained glass windows featuring English sporting heroes the main point of interest. Pull up for a refreshing pint of Man in a Box for 1.99. Refreshing. For a slightly more sophisticated brew try the Sam Smith's Pure Lager in a tall glass. Decent pub nosh and a reasonably friendly antipodean staff. If you don't mind standing join the office boffins on the sidewalk on a Thursday or Friday. Otherwise pull up a pew in the air conditioned surrounds upstairs.